Remember when everyone got upset because Justin Bieber went to Rolling Stone and said he supported universal healthcare but was pro-life? It was like we were treating the 17-year-old like an adult with opinions that deserve debating! So silly! Because just for reference, Justin Bieber wears a necklace of Stewie Griffin from "Family Guy" around town, and that necklace costs $25,000. I would not take his opinion on the best part of Epcot Center seriously, let alone his views on abortion. To be fair, a lot of rappers wear ridiculous bling. 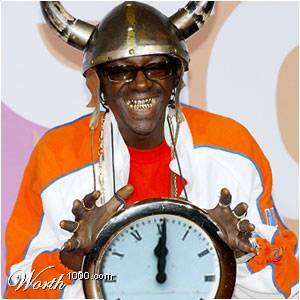 Flava Flav has that clock necklace, and Lil Wayne has a giant piece of gold that spells out "Crunk Ain't Dead" in what has to be the heaviest piece of sloganeering ever. Then again, I wouldn't really let these people influence my opinions on today's "hot topics" either. And at least they aren't literally wearing a giant, talking baby around, the symbolism of which is not lost on anyone.